I'm running Ubuntu on my Thinkpad T60. Is there a way to get the middle button to act like a scroll like it would when it runs Windows? I'd like to be able to hold the middle button down and scroll down a webpage using the red button. check "Use middle button emulation"
ThinkWiki has instructions on how to do this. Specifically, how to use xinput(1) to configure the TrackPoint. 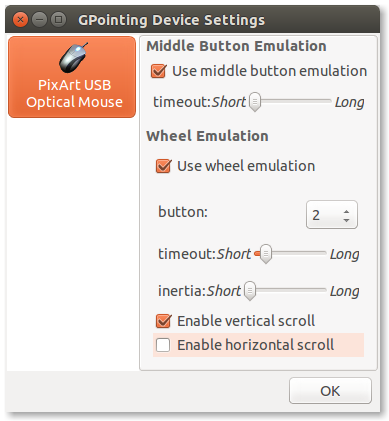 or via software center "gpointing-device-settings"
To get "natural scrolling", that is, scrolling in the direction of the pointer, you can swap the YAxisMapping values to be "5 4" instead. I restarted after I swapped mine and it worked fine.